Ford: due to snow entering through cowl top area and melting, allowing the water to enter blower motor and when its below freeze overnight, refreezes, causing a lack of heat resulting from frozen blower motor. model 2011-2014 fiesta. Ford: some vehicles may experience a hood cable buzz noise like an exhaust type of noise, from drivers side exterior bulkhead during light/medium acceleration after coasting in 3rd gear. models 2011-2013 fiesta. Ford: blower motor freezes after snow melts or water enters, during overnight below temperatures, causing a lack of heat. models 2011-2013 fiesta. updated 1/15/14. Ford service campaign: see document search button for owner letter. the engine block heater can become loose and leak coolant. engine could run rough as well as white exhaust smoke, no start, and engine damage. Ford: the check engine or traction control light may be on with two possible trouble codes. there may be debris that restricted the camshaft timing. 2011 fiesta. 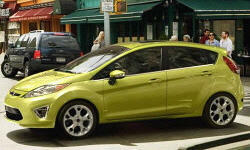 Ford: on some 2011 fiestas there may be a variety of starting problems and engagement problems. there may also be a check engine light on with two possible codes stored. Certain 2011 through 2015 model year fiesta and 2012 through 2014 model year focus vehicles equipped with a dps6 automatic transmission - transmission control module reprogramming for overt tcm failure warning. Certain 2011 through 2014 model year fiesta and focus vehicles equipped with a dps6 automatic transmission - transmission clutch shudder / transmission input shaft seal warranty extension. Ford: due to excessive transmission clutch shuddering that some vehicles experience during acceleration, a leaking input of shaft seals cause fluid contamination of clutch. model 2011-14 fiesta. Ford: when attempting to monitor, from transmission control module, an inaccurate reading appears while monitoring app1 pid, and required 30% acceleration rate outlined is pinpoint test n (2011-13). model 2011-15 fiesta. Ford: a message is displayed regarding the transmission over heating, due to diagnostic trouble codes (dtc) and message can be display without overheating of transmission. model 2011-2014 fiesta, focus. Ford: in the 2nd and 4th gears of transaxle, some vehicles may would experience a grinding, rattling noise and it can occur in reverse. model 2011 fiesta. Ford: during cold ambient temperatures, and at light acceleration or coasting, a grinding, scraping noise is heard, between 20-50 mph. model 2012-2013 fiesta, focus. Ford: transmission fluid leaked on clutch assembly and by using metal parts cleaner, containing 60% acetone or 60% heptane, effectively, will clean fluid. model 2011-2014 fiesta, focus. Ford: there may be a loss of power, hesitation, surge, or lack of throttle response while driving. the brake over accelerator feature may be activating. Ford: some vehicles experience incorrect displays of english or metric units odometer and need instrument panel cluster (ipc) reconfigured and replaced. model 2011-15 fiesta. Ford: if there is an intermittent lack of power, surge, or hesitation while driving the brakes will override acceleration. Comm-trans lund: some 2009-2011 models may have the air bag inicator flashing with a stored trouble code. this is a software problem. The procedure in video has not changed. the new screen (d2bz-18d395-a) installation is the same as the previous level part used in the video. the video is located under gsb g0000060. Ford: on various vehicles with my touch,after any apim programming, replacement or disconnect from front display interface module (fdim), touchscreen calibration must be performed. model years 2011-2013. no models listed. Ford: see document search button for owner letter. certain model year vehicles may experience an improperly programmed auto-unlock or auto-lock feature, at time of manufacture, resulting in a malfunction. Ford: 2011 fiesta. the manual windows may drop while driving. Ford: on the 2011 fiesta many electronics (power locks, keyless entry, radio...etc) are inoperable while the vehicle is off.